Turkish President urges international organizations to impose sanctions on the Netherlands. 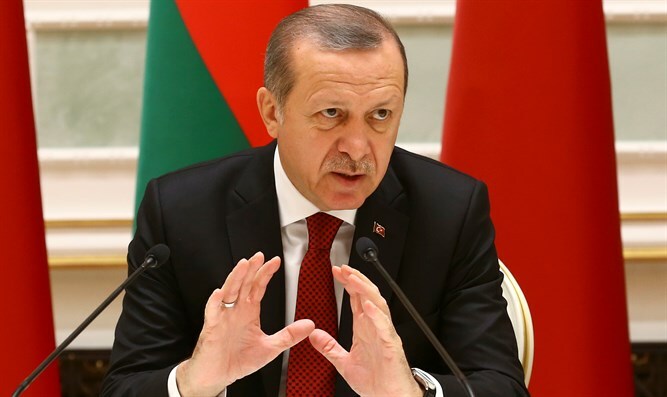 Turkish President Recep Tayyip Erdogan on Sunday called on international organizations to impose sanctions on the Netherlands amid a diplomatic row between the countries, Reuters reported. Speaking at an event in Kocaeli province, near Istanbul, Erdogan said the Netherlands was acting like a "banana republic", and criticized European countries for failing to voice criticism for the Netherlands' treatment of Turkish ministers. On Saturday, the Netherlands refused to allow Turkish Foreign Minister Mevlut Cavusoglu to land in Holland and Turkish Family Affairs Minister Fatma Betul Sayan Kaya to reach the consulate. Later, they blocked off the Rotterdam consulate, and Kaya was forced to hold meetings in her office. In response, Turkey announced it "does not want" the Dutch ambassador to return to his post in Turkey, while Erdogan accused the Dutch government of being "Nazi remnants" and "fascists." "You can stop our foreign minister's plane all you want, let's see how your planes will come to Turkey from now on," Erdogan said on Saturday at an Istanbul rally. "They are Nazi remnants, they are fascists." Netherlands Prime Minister Mark Rutte called Erdogan's remark comparing the Dutch to the Nazis "crazy." "I understand they're angry, but this, of course, was way out of line," he said.